Okay! 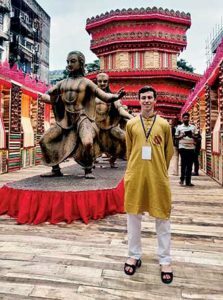 Zoom the camera in on a tall (precisely 6 feet 2 inches), fair and handsome young man clad in a school uniform walking towards the puja pandal – our protagonist, Dane Rowan Osborne Liebermann. Allow me to introduce you to a boy all the way from the United States of America who is part of a student exchange program and has made India his home till May 2019. Dane is a part of the YES (Youth Exchange and Study) Abroad program. In India, Dane’s host school is Lakshmipat Singhania Academy, Kolkata (where I teach). Dane has chosen to study science and is in standard XI. In July this year, when Dane arrived and I was told that he would like to pursue my subject (mass media studies) as a vocational one, I was a little tense. My curriculum includes Bollywood movies with its typical song and dance elements and I thought Dane might feel out of place. His first class with me, I was explaining scenes from Ramesh Sippy’s Sholay. As Dane entered the class, on my smartboard, Daku Gabbar Singh (Amjad Khan) was asking his gang, “Kitne aadmi the?” This boy had come from a faraway land, had no connection with Hindi or Indian films and a scary dacoit on screen was welcoming him! Gradually, Dane and I started interacting… initially with a little inhibition, but now we have a cool teacher-taught relationship and a decent number of Hindi movies on the watchlist. The first thing that I decided when I said ‘yes’ to writing this article was that it would be Dane’s account about life here and that I would simply be his transcriber. Dane is from Vermont, USA. He is a student of U-32 in East Montpelier. Now that he has spent a few months in a prestigious Kolkata school, Dane tells me he finds the Indian education system far more challenging. “In India, I found students are expected to spend hours outside of class studying from textbooks to stay ahead of the race. For me, it has become the hardest aspect of living here. But you know what I loved here the most – the idea of collectivism of individualism, so commonly overlooked in the United States. I was surprised by how connected families are and how they stick together through all phases of life.” Dane recollects how in mid-August he fell terribly sick and eventually garnered strength to stand on his toes only with the constant support of his host school and family. Dane’s hobbies include playing soccer, athletics, anything outdoor. He loves to travel and learn languages. In the US he was learning French and his clear goals are to learn a couple more languages before he turns 30! One of his favourite pastimes is do woodwork. He learnt carpentry from his father, who is an avid builder. Dane has built his own tree house. When Dane arrived in India he was worried that he might have no way of fine-tuning his carpentry skills. 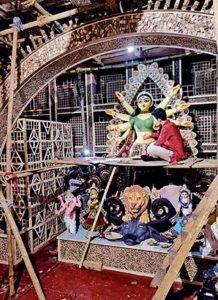 But as luck would have it, he chanced upon the Bakul Bagan Puja Committee (Durga Puja Pandal in Kolkata) through one of our school teachers and struck the right chord there. I will take my readers again to the beginning of this article when Dane was walking towards the pandal. Dane’s first visit to the puja pandal attracted him to the craftwork there and he volunteered to help the designer in his venture. All the people involved with the Puja Committee were taken aback by Dane’s interest and enthusiasm in decorating the pandal. Bimal Samanta, the designer of the pandal was full of pride when I asked him about Dane. He said, “Oh, the boy is full of energy and dedication. He learns so quickly that I really enjoy teaching him. He is here at the pandal everyday after school sharp at 4 in the evening and the weather also cannot deter him. He made jewellery out of Areca leaves for the deity. I love the way he says ‘Namaste’ and ‘Achha’. I am going to miss him after the puja.” Dane found that during Durga puja people were running around to different pandals at three in the morning in fine clothes forgetting the silly divisions of religion or class. He also travelled to Ahmedabad to enjoy the Navratri festival and tapped his feet to the Garba moves! The author is a teacher of mass media studies at Lakshmipat Singhania Academy, Kolkata. She can be reached at sourinabose@gmail.com. The Kennedy-Lugar Youth Exchange and Study (YES) program was established in October 2002. The Bureau of Educational and Cultural Affairs of the US Department of State, along with the US exchange community, recognized the importance of youth exchange as a key component to building bridges between citizens of the United States and countries around the world. The program was officially launched in India in 2005 to expand communication between the people of the United States and India to promote mutual understanding and respect. Since then, over 500 Indian students have completed the YES program and now participate as alumni. The YES program is administered in partnership with the US Department of State by a consortium of non-profit organizations led by the American Councils for International Education. In India, AFS (American Field Service) India manages the YES program in partnership with the local US Embassy, Public Affairs Office.